Nestled alongside an airy courtyard in Grand Park City Hall lies Indulge at Park, a weekday Bistro and weekend Buffet place. 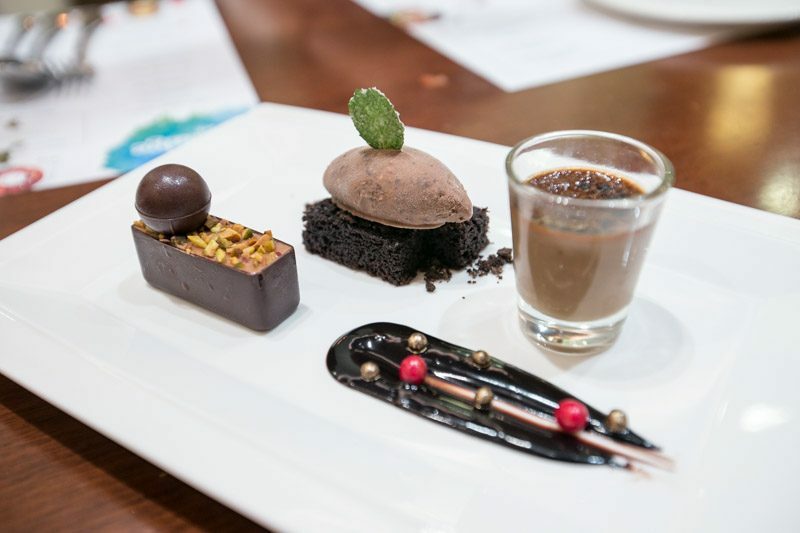 Their magical array of Western, Asian and Local Delights are prepared with the freshest ingredients, brought together with an ingenious twist in the hands of Executive Chef Eric Ong. 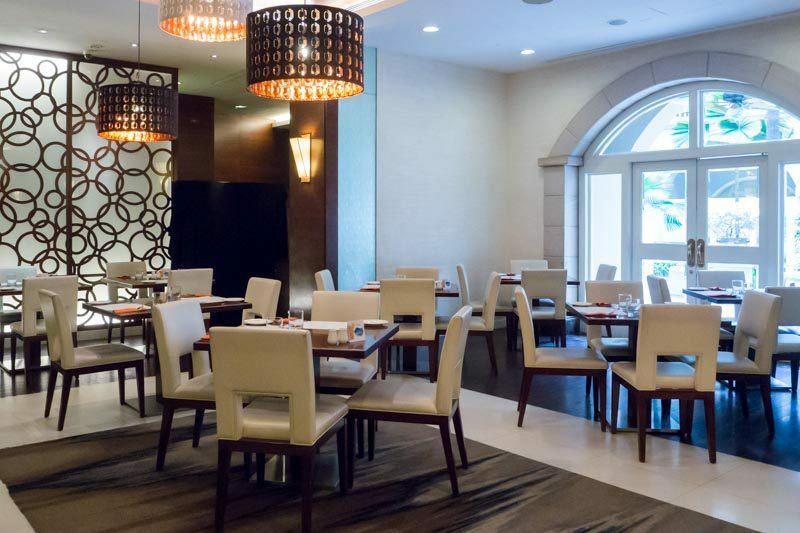 Wide and spacious with daylight pouring through tall arc glass doors, Indulge at Park sets a friendly and relaxing atmosphere for all to dine in. What’s even better about Indulge at Park, is that there are 20 types of beers that Beer Tavern that you can select from to be brought over to Indulge to heighten your dining pleasure. 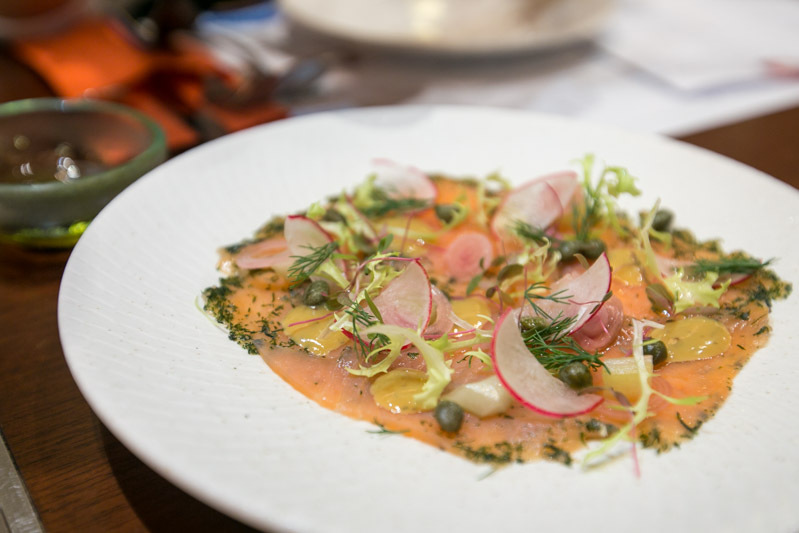 Salmon Gravlax ($20), a Nordic dish consisting of thinly sliced salmon comes with pickled cucumber, andhovmästarsås (sweet dill and mustard sauce), accompanied by radish, capers and fresh greens that give the otherwise velvety dish a fresh crunchy character. Slight herby accents and the acidity from the pickles and mustard balance out the savoury salmon flavours. 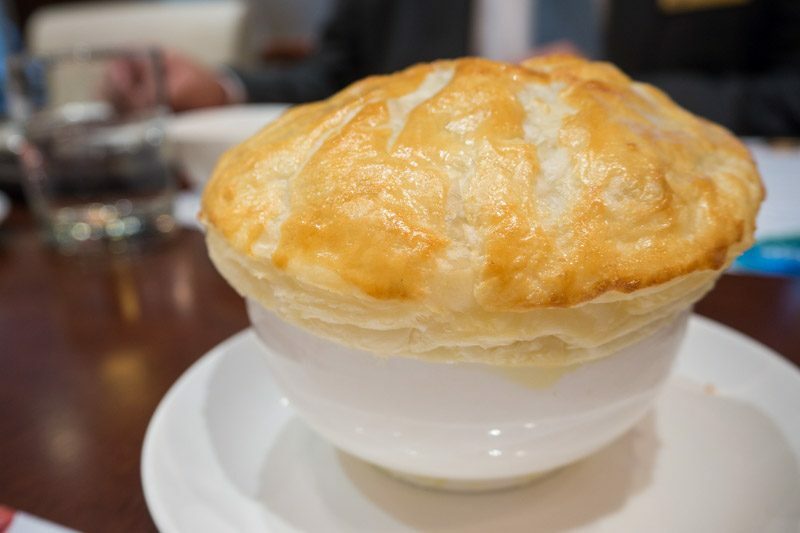 Their Classic Onion Soup ($16) comes with a soft puffy pastry sitting gently atop the bowl. 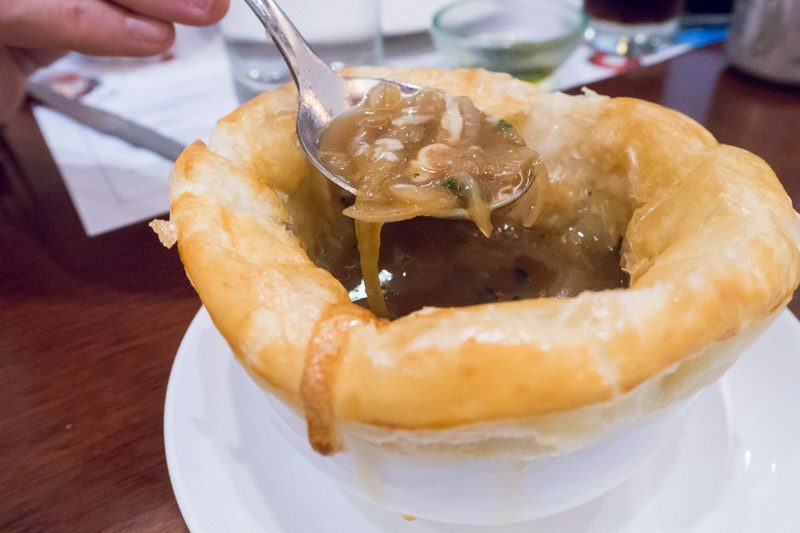 Upon making a small indentation in the pastry, its roof caves in to reveal a piping hot bowl of onion soup. The first spoonful uncovers a bit of chewy, stringy mozzarella cheese – rich, heavy and with a dash of black pepper, this classic will warm you right up because it’s so robust. 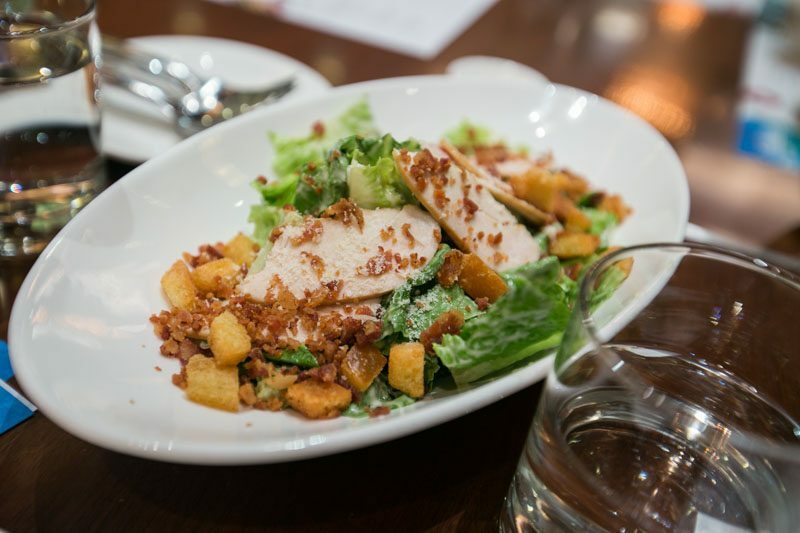 Shake A Caesar Salad ($18) is an interactive dish as suggested by its name. Chuck everything in the jar, shake it like a polaroid picture, and you’ve got a “tossed” Caesar Salad ready for consumption. A welcoming mix of sweet and sour from the cheese and sauce, together with crunchy flavour bombs from the smoky bacon and anchovies make this dish more than just an ordinary salad. Did I mention that the croutons are on point as well: butter-soaked and crunchy, they made me forget at one point that I was consuming healthy greens. The Nicoise Salad ($20) is a light dish that will leave a clean finish on your palate. 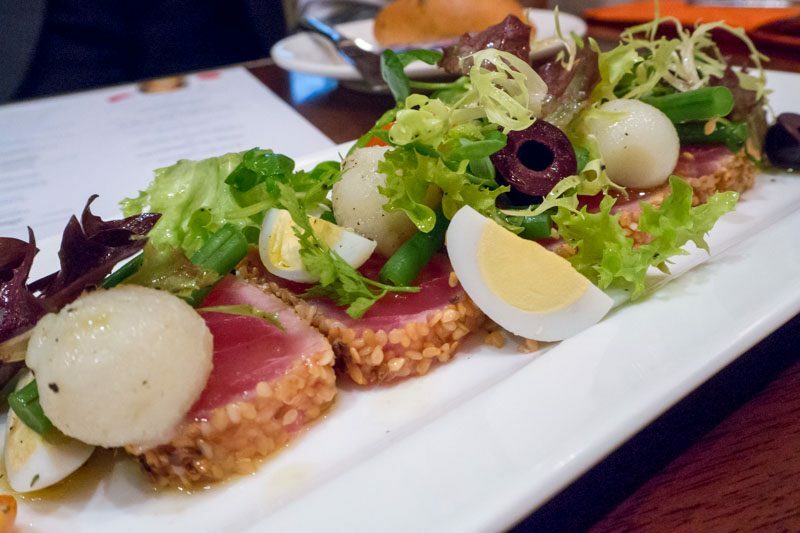 The seared Yellowfin tuna comes fresh, pink and soft with a coating of sesame seeds that give it a light fragrance. It also comes with quail eggs, tomatoes, green beans, new potatoes, olives and sherry vinaigrette plus a sprinkling of salt and pepper. The Slow Roast Salmon ($32) came with a wonderfully pink centre and flavourful crispy skin. 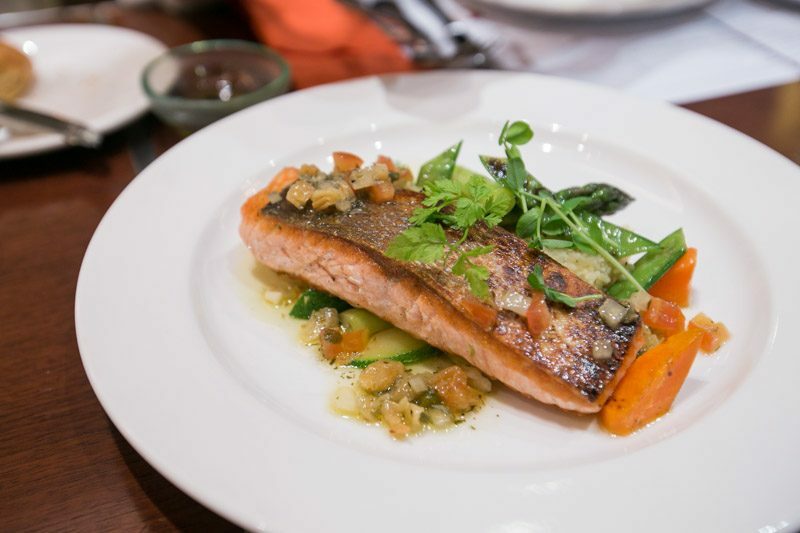 The golden raisin relish introduced a sweet citrous tang, while the cous cous brought a heavy flavour to the lightness of the salmon. 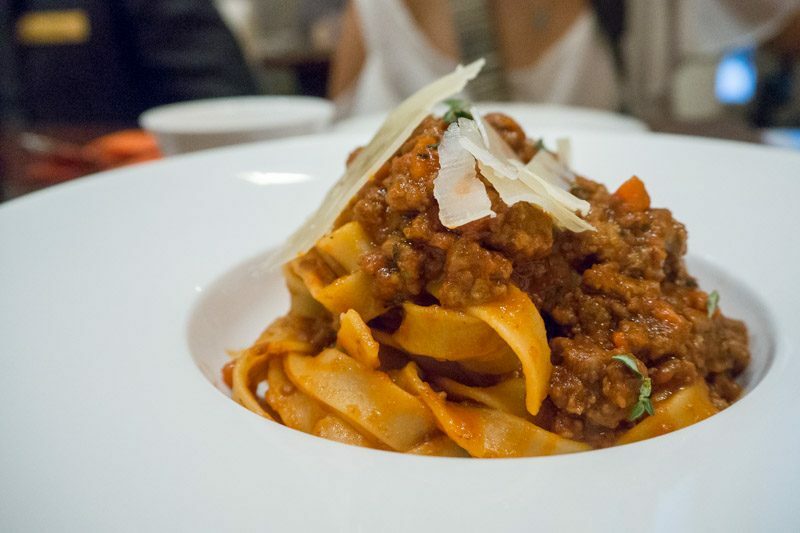 Their Fettuccini Bolognese ($26) is generously graced with a large serving of minced beef and pork with tomato sauce. The fettuccini is thick, fat and voluminous – attributes that I simply adore about pasta. I also really appreciate how the tomato sauce isn’t overwhelmingly sour and has the right balance between savoury, sourness and viscosity. 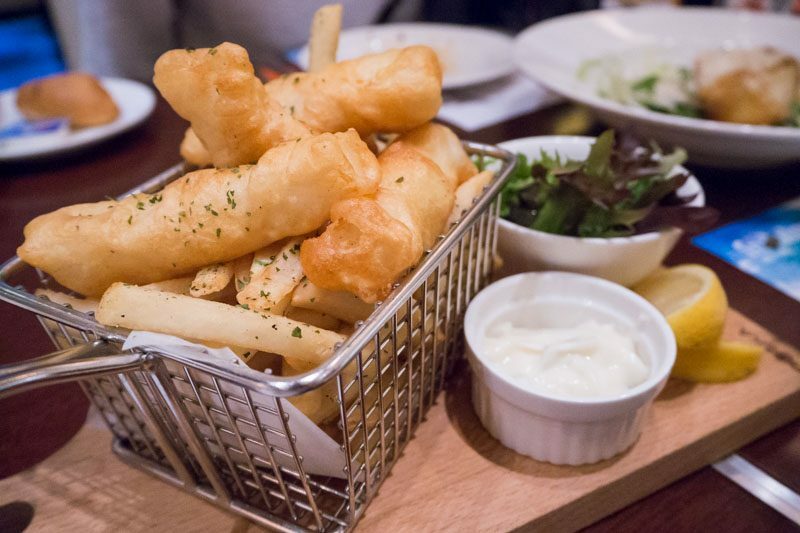 Battered Atlantic Cod Fish And Chips ($30). I felt that the batter would have been better if it was crispy rather than the soft texture it was presented in. Considering the price, I felt that it could do with a larger serving. Pan Seared Atlantic Cod With Coriander ($32) with horse radish and shellfish emulsion. 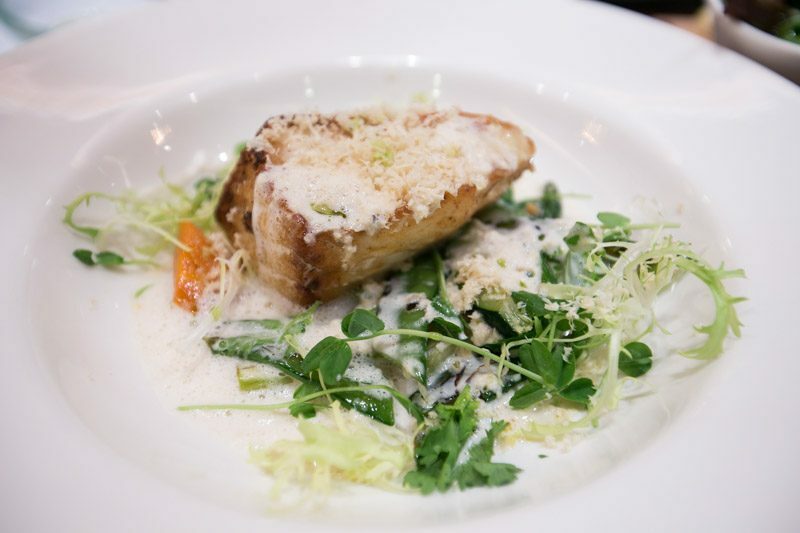 The cod is thick cut and has soft large flakes that fall apart easily with its exterior crispy and piquant. It has slightly sweet hints, which match the heady flavours brought out by the shellfish emulsion. Infused Lemon Grass Kurobuta Pork Shoulder ($28) with cabbage variations. This dish reminds me very much of rendang with strong distinct flavours of lemongrass infused into the pork. The meat itself is very tender. 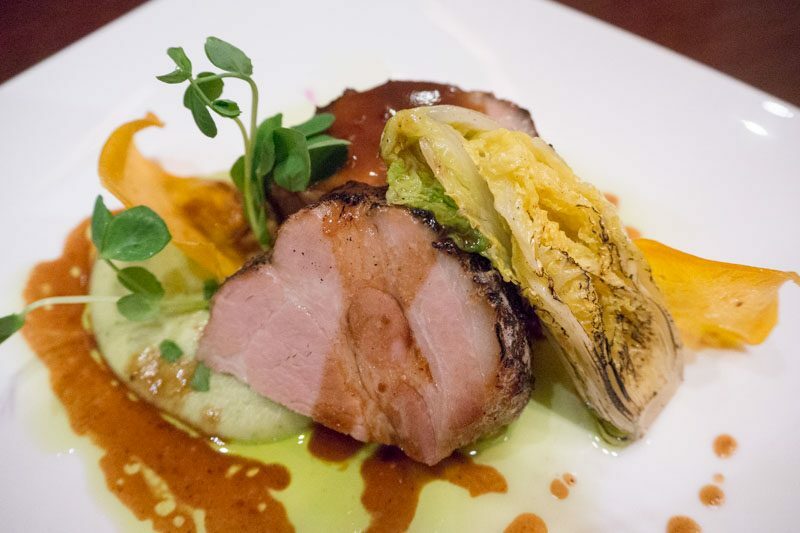 Its comes three kinds of cabbage variations to pair with the meat: inner pockets of a Nappa cabbage (the sweetest part of the cabbage), pickled cabbage, and cabbage puree. Australian Tenderloin, Grass Fed, 200g ($46). Served medium rare, the steak is pink in the middle, soft and tender, with a hint of smokey flavours. 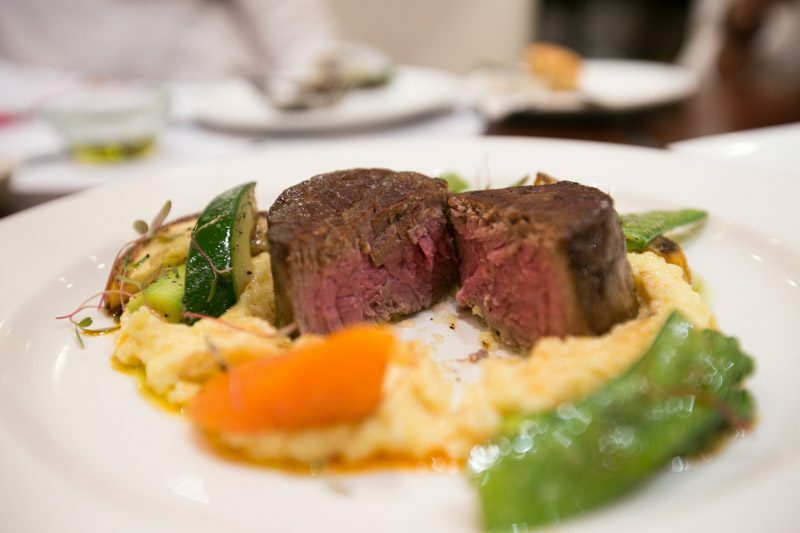 Served with truffle polenta, the tenderloin tastes extremely gamy, which some might not appreciate, but could be perfect for others. The Snow Crab Meat, X.O. Sauce And Egg White Fried Rice ($30) is my favourite on their menu. Light yet flavourful at the same time, this dish was satisfactory on all levels possible. Fried together with the rice is copious amounts of small ikan bilis that make every bite a wonderful delight. On top of that, the snow crab soaked in X.O. sauce is fresh, juicy and tender. Unlike the usual fried rice, this one doesn’t leave behind that unhealthy greasy sensation that we all dislike. Braised White Noodles With Clams And Mussels ($26). This white bee hoon dish felt very homely and warming with its light eggy, milky and peppery flavours so similar to a mother’s recipe. I must say that the clams and mussels were very well-cooked as they maintained their thick and juicy states. 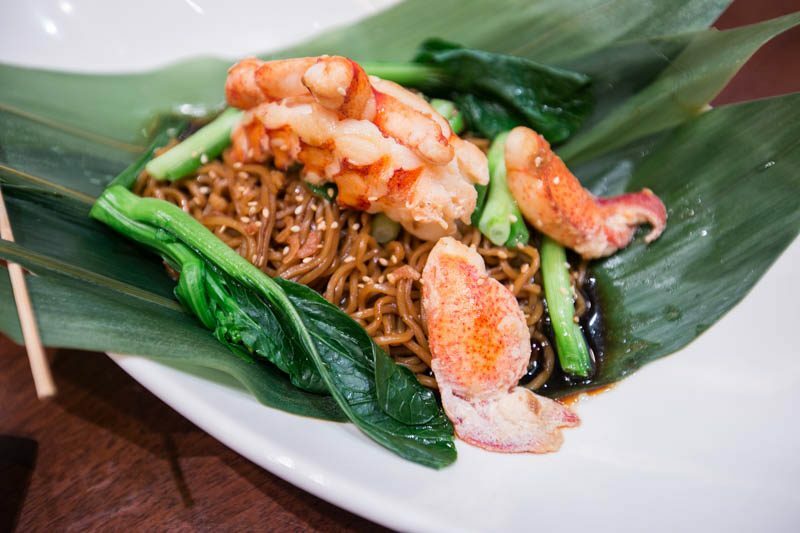 Maine Lobster With Shallot Oil Tossed Noodles ($42). 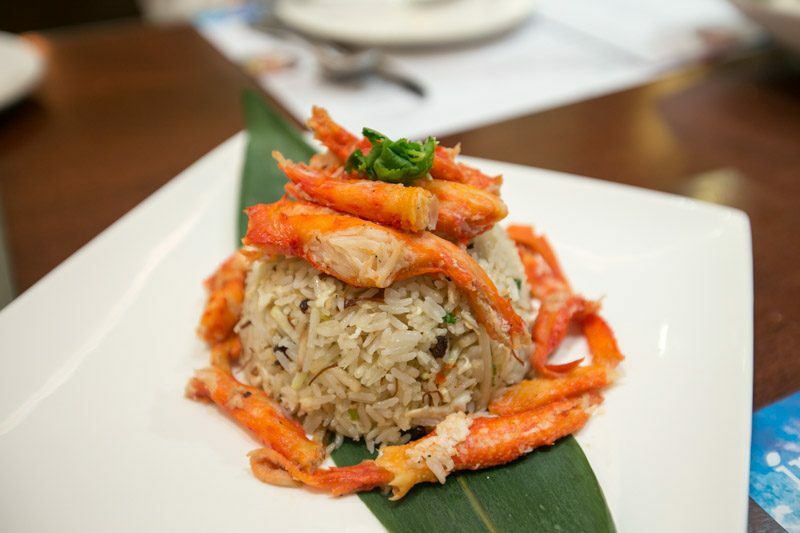 As you bite into the lobster, its flesh literally bursts into your mouth – it’s so succulent that it doesn’t even feel like you’re eating lobster flesh. Drenched in sauce, the noodle is really flavourful and has a springy texture. Texture Of Chocolate ($18) is presented in four variations: chocolate mousse, chocolate tuile, hazelnut chocolate ice cream on top of chocolate sponge, and chocolate creme brulee. The creme brulee is my favourite with its thin layer of crisp caramelised sugar and thick milky chocolate cream lying underneath. Second to that would be the hazelnut ice cream and chocolate sponge – the sponge has an airy and doughy consistency, which pairs well with the nutty essence from the ice cream. 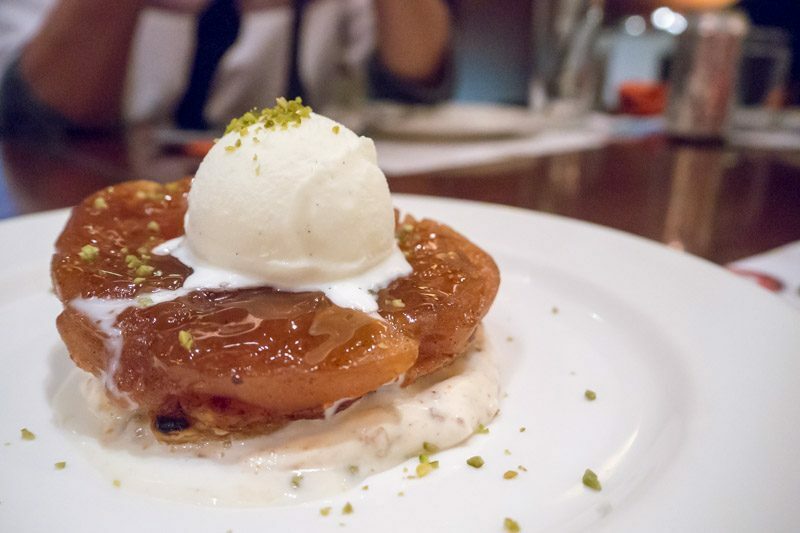 Appletatin Tart ($14) with candied pecan chantilly cream and vanilla bean ice cream. I rarely order apple pies for dessert, as more often than not I get disappointed with what I’m served with. This, however, exceeded all expectations. The apples are faultlessly caramelised and thankfully do not have any trace of unwelcome sourness. The pastry sitting at its base is puffy and when it gets soaked in cream, tastes amazing. Scattered around, hidden in this dessert are candied pecans which are so sweet and crunchy, you won’t believe you’re eating pecan nuts. And of course, the vanilla bean ice cream wraps all elements of the Appletatin tart together with its light, sweet creaminess. Indulge at Park is a wonderful place to have a laid-back weekday afternoon lunch with a great selection of dishes from different cuisines to choose from. 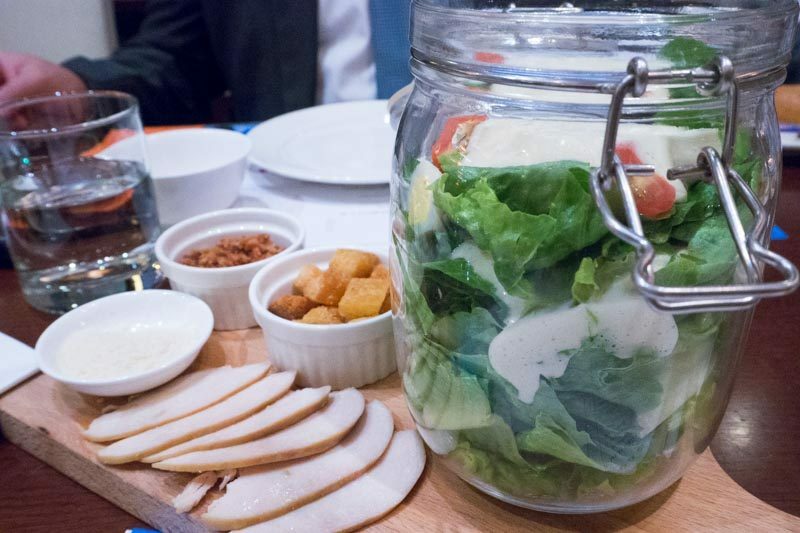 From the not-so-conventional Caesar salad to zi char food with a classy spin, to ending your meal with artisanal desserts, it’s a place for indulgence and the pampering of your palate. The Asian dishes were really the highlight for us, and you don’t want to miss the fried rice and white bee hoon. 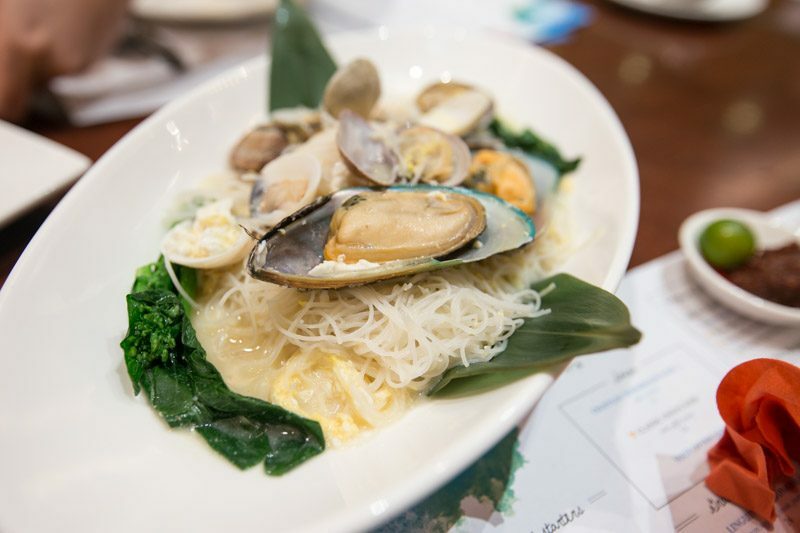 Asian Weekend Tunch – With over 80 dishes in the buffet spread, all kinds of palates will be satisfied with options like lunch and tea favourites such as the signature Tianjin pancake roll, Hong Kong roasts, assorted Dim Sum, Penang Rojak, Assam Laksa and an amazing dessert selection. Asian BBQ Fun – Nothing says “weekend” better than a scrumptious barbecue with family and friends. Chow down on Indulge at Park’s Asian-inspired BBQ spread. Pick your favourites, slather on your choice of marinade and have it grilled to divine perfection! 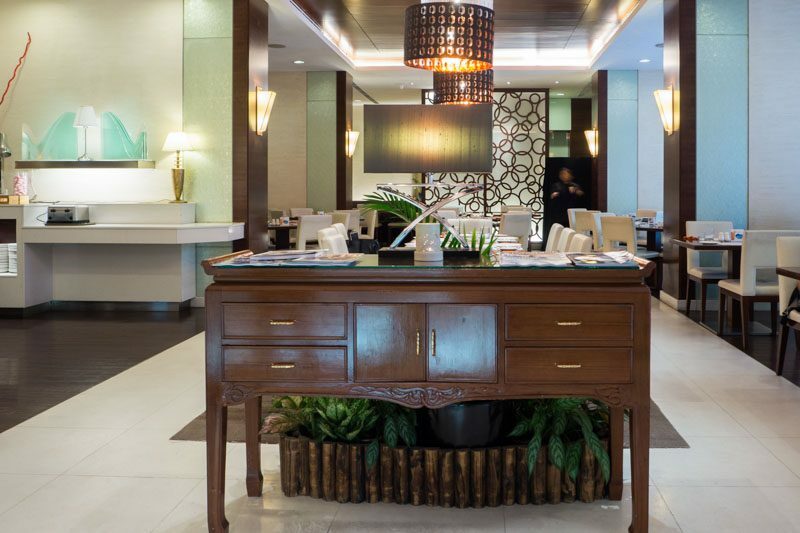 In addition, you get to enjoy a range of over 80 dishes at the international buffet spread. Lover of innuendoes and appreciator of puns. Avoids veggies. Must be fed regularly. Spirit animal: Ron Swanson.